Triton's LXT-LK6 is a nicely built aluminum trailer to haul your recreational and touring kayaks. 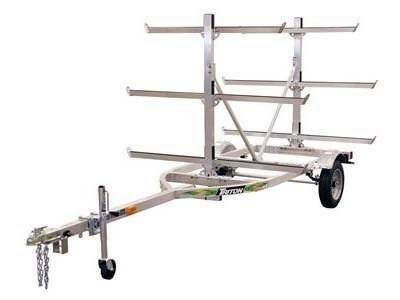 This six place spring axle aluminum trailer is easy to handle and maneuver even off the hitch. Triton continually makes solid trailers with all of those little things done right to prevent those headaches down the road. There's no match on the market for this kayak aluminum trailer. The quality components and innovative designs makes for a trailer that will provide many years of worry free use.